Vin Scully recently marked six decades in the broadcast booth, a full 3 years longer than this vintage Topps card has walked the earth. What does Scully mean to the Dodger faithful? My dad, an Internet-less resident of northwestern Arizona, still drives his car into the pass between two nearby mountains to catch radio broadcasts from LA--that's what. Jim "Junior" Gilliam succeeded at a job few would want, displacing Jackie Robinson from 2nd base. 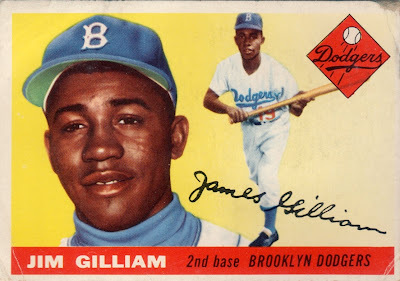 His range, speed on the base paths, and good batting eye proved essential for Brooklyn and LA Dodger teams that appeared in seven World Series between 1955 and 1966, winning four. 1955 Topps closely resembles (pre-sembles?) the superlative 1956 set, showing both portrait and action shots on the front. 1956 adds the action shot in full field context, which makes for some awesome composition. 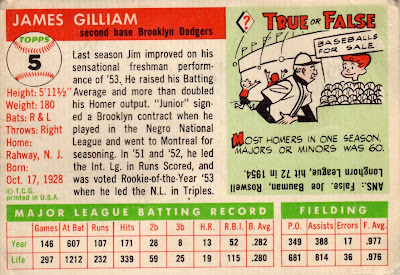 1955 card backs mix stats--both batting and fielding--with classic cartoons and a one-paragraph bio. I like 1956's front design much better, but still rank 1955 in the top 3 sets from that decade, behind 1956 and 1952. 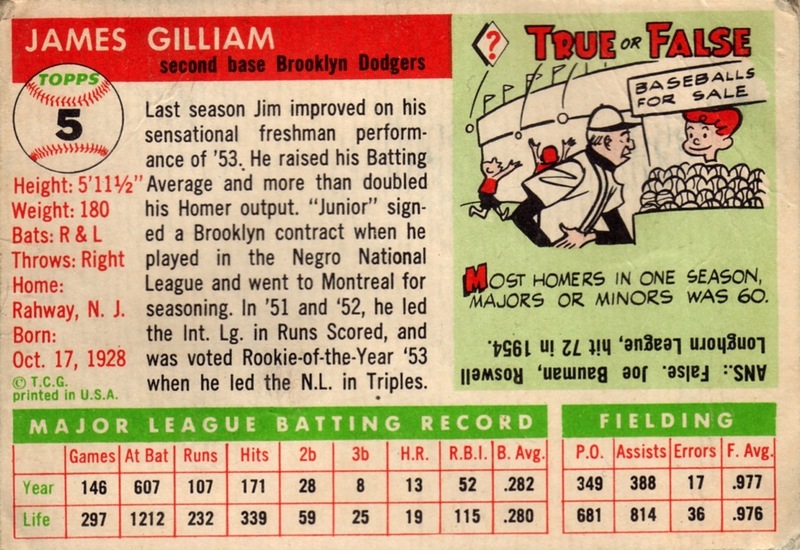 Value: You can find low-grade Gilliams for under $10, but they often cost more due to Brooklyn's cachet and Jim's significant role on so many title winners. Fakes / Reprints: Now that Topps is "repackaging" their vintage designs on a yearly basis, watch for cards that look like they came from 1955--but didn't--as reprinted by Topps or faked by scammers. Superstars from this set will cost quite a bit, so also beware of too-good-to-be-true deals. The 1950s Topps sets were beautiful.